FIlter Your Results by Format, Date, Etc. View Full Text Articles, eBooks, Journals, etc. Go to the Library Home page and enter your keywords on any topic in the search box where you see "Find article, books, videos, and more..."
Use the search box drop down menus to search for articles, books or videos by keyword, subject, title, author or ISBN. Enter your words in the box. Words can be in upper or lower case. Multiple words can be entered in any order. From within your search results, you may add Selected Filters from the options in the left column to refine your search. Keep the same filters for your searches by checking off the box for "Keep Selections for Next Search." You can see additional categories by clicking on Show More. By default, the search results will first display those items owned by Wilmington University Library. You can change the default Library sort and choose to sort your results by Best Match, Recency, Author (A-Z), Date (Newest First), Date (Oldest First), Most Widely Held (meaning owned by other libraries) or Title (A-Z). Scroll down to see each sort option and corresponding behavior. Blends Title, Author, Date and Worldwide Holdings with an emphasis placed on Title. Blends Date, Title, Author and Worldwide Holdings with an emphasis placed on Date. Considers individual holdings first, then blends Title, Author, Date and Worldwide Holdings. Sorts by special characters or numbers in the first name, then A to Z by last name. Sorts chronologically by publication date with newest items listed first. Sorts chronologically by publication date with oldest items listed first. 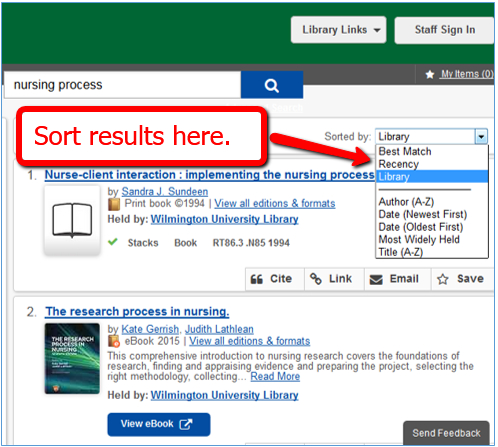 option to view best results for interlibrary loan requests. Sorts by special characters, then alphabetically by Title. Only the article "the" is ignored. By default, Discovery will first display those items owned by Wilmington University Library. 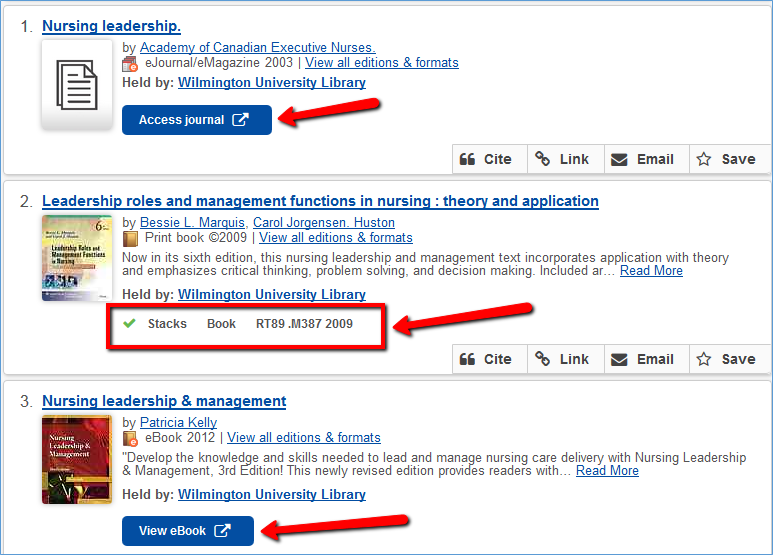 The "View Full Text" button will appear for any articles from WilmU subscribed or open access resources contained in the databases. Click on "View Full Text" to view the article in its home database. You may be prompted to log into MyWilmU before getting access to the article. 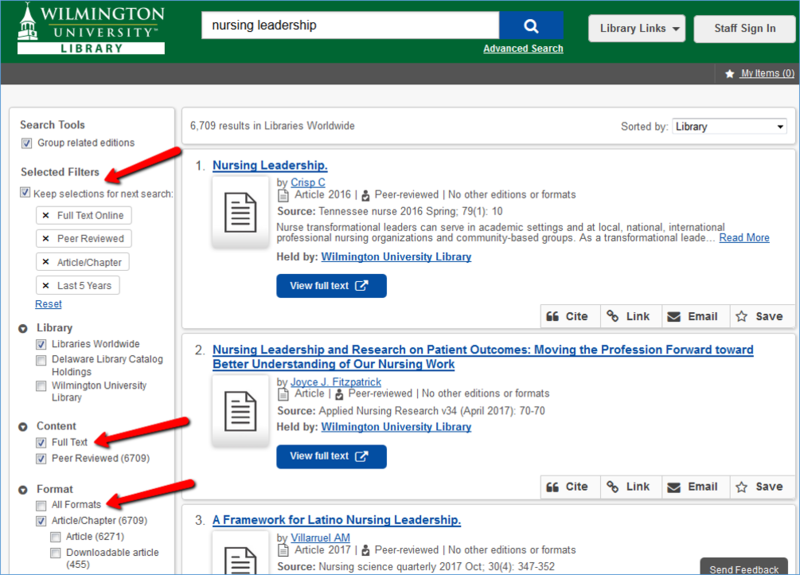 Depending on the content format, you may also click on "Access Journal," "View eBook," or for print materials, you may see the shelf location. Discovery systems work to link data from many systems to bring as many resources to the user as possible. By default, Discovery searches WorldCat.org, a growing catalog of millions of records from libraries across the globe including content from 100+ WilmU Library subscription databases. A few publishers and database vendors are still in the process of formatting their data so that it can be included in a Discovery search. Financial information databases including Mergent Intellect, Mergent Archives, Sports Market Analytics, Value Line Research Center, along with Security Management Practices and a few Gale databases contain content that cannot be searched in Discovery. These databases should be accessed individually from the A-Z list.